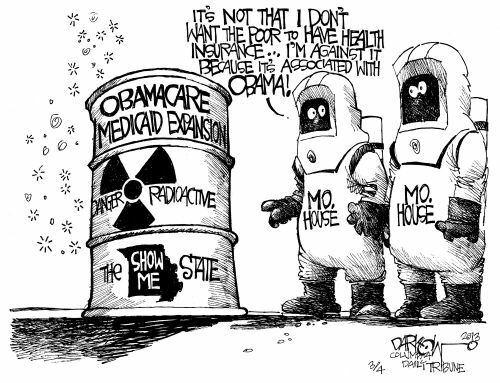 Millions of words have been written about Medicaid, and the failure to expand it, in Missouri. The words have fallen on deaf ears. Maybe we need to buy our legislators hearing aids? Or, maybe instead of words, we need to add lights….cameras….action, as in this two-act morality play about those who have misplaced their morals. ACT I: Our hero is walking down the street carrying a heavy backpack. It is stuffed with money. On the corner he meets a man and woman who are having a bake sale. They are shivering in their threadbare sweaters and look frail and vulnerable. Our hero ignores them, although the money is making his backpack very heavy. He goes to another corner, where he sees a man in a Brooks Brothers suit and highly-polished Gucci shoes with a Louis Vuitton briefcase open in front of him. The man whips out his checkbook and writes a big check to our hero, who stuffs it in his pocket. He then opens his backpack and dumps the entire contents into the man’s Louis Vuitton briefcase. On the other corner, the bake sale man and wife are packing up their home-baked goods and wiping up the crumbs. Previous Post:Who really won the Cold War?